Welcome to the website of the Masonic District of South Africa, North. 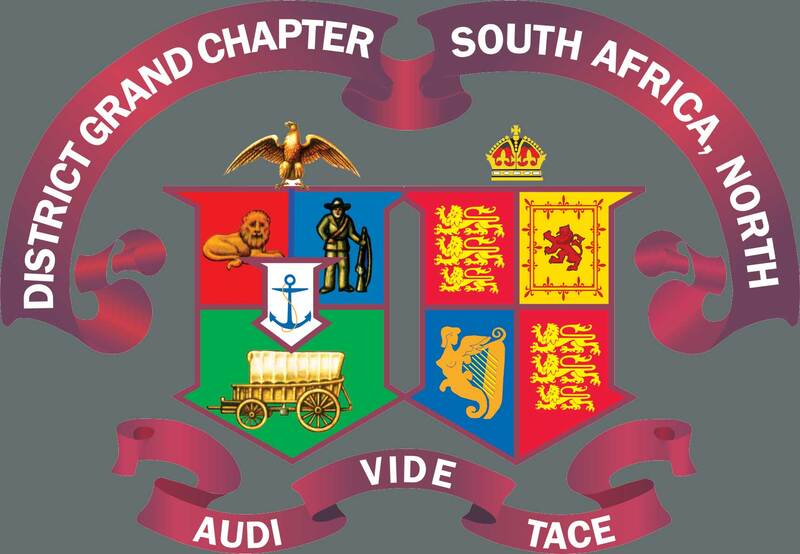 The District of South Africa, North falls under the authority of the United Grand Lodge of England, which was founded in 1717 and is the premier Grand Lodge in the World. The United Grand Lodge of England is made up of several Provinces in England and Districts overseas. The District of South Africa, North is the largest District outside of England, with over 2300 members from all ethnic, cultural and social backgrounds that meet in 101 Lodges located mainly in the northern part of South Africa. Welcome to you all to this 112th Annual Convocation of District Grand Chapter, and I extend a warm welcome to our distinguished guests and trust you have enjoyed our proceedings. Companions in previous years we have held the Annual Convocation at the Linder Auditorium. Brethren welcome to this our 118th Annual Meeting of District Grand Lodge and thank you all for your attendance here today. I would like to thank those Brethren who have travelled far to be with us for this occasion from all corners of our District, from Botswana, Swaziland and including Mauritius, of which I will say more later. I trust you are all enjoying your stay in Johannesburg. Welcome to you all to this 111th Annual Convocation of District Grand Chapter, and in particular, to those who have travelled long distances to be with us. I extend a warm welcome to our distinguished guests and trust they have enjoyed our proceedings. I would like to acknowledge the presence of E Comp Randhir Ramloll who is here today for the first time as the Charter First Principal of the Chapter of Friendship No. 1696, in Mauritius together with Comp Ajay Nunkoo, Charter Princ. Sojourner.. Brethren, welcome to this our 117th Annual Meeting of District Grand Lodge and thank you all for your attendance here today. I would like to thank those Brethren who have travelled far to be with us for this occasion. I would particularly like to acknowledge Wor Bro Bhuruth, Wor. Master of the Lodge of Friendship, who is accompanied by 10 Brethren - one of the largest contingents from Mauritius that we have ever had the pleasure to welcome to District Grand Lodge. I do hope you are all enjoying your stay in Johannesburg. Welcome to you all to this 110th Annual Convocation of District Grand Chapter, and in particular, to those who have travelled long distances to be with us. I extend a warm welcome to our distinguished guests and trust they have enjoyed our proceedings. Brethren, This evening I would like to share with you some of the most important ideas which have been put forward in recent years by the Grand Master, the Pro Grand Master, the Grand Secretary and other high rulers of our Order on the future of Freemasonry. The Grand Master has stated: “Talking openly about Freemasonry, as appropriate, is core to my philosophy, central to our communications strategy and essential to the survival of Freemasonry as a respected and relevant organization”. Brethren, welcome to you all to this our 116th Annual Meeting of District Grand Lodge and thank you for your attendance here today. I would particularly like to acknowledge and thank those Brethren of our lodges in Mauritius, Botswana and Swaziland who have travelled far to be with us today. It is also indeed a pleasure to acknowledge the presence of our RW Past District Grand Masters and I thank them for their attendance. Welcome to you all to this the 109TH Annual Convocation of District Grand Chapter, and in particular, to those who have travelled long distances to be with us. I extend a warm welcome to our distinguished guests and trust they have enjoyed our proceedings. This address is based substantially on a paper presented by Lord Northampton, the Past Pro Grand Master in 2005 to the Cornerstone Society, London. We belong to the biggest Grand Lodge in the world with a membership of some 272 000 Masons spread over the four quarters of the globe. Throughout Provinces, Districts and the London Metropolitan area, great efforts are being made by many Brethren to recruit, retrieve and retain our members (The Masonic “Three R’s”) with various schemes designed for that purpose. However, something is not right with our Anglo Saxon Freemasonry. The overall picture is far from satisfactory as you will appreciate from the following figures.